Being able to decode the various markings on a car or part is important in establishing what type of car or part you have. This site is one of the most comprehensive numbers decoding places available anywhere. From this page, you can quickly get to the specific codes. I try and answer emails and decode specific requests, but often you can find the information here if you spend a couple minutes looking. Above, left: A trim tag, lists original interior trim, exterior color, build date and other fisher body info. Above, right: An engine showing engine suffix code and partial vin code. You can verify the model of a car, or the originality of a car. The primary number on a car is the VIN number. The VIN is the legal and most accurate representation of the car. This will tell a lot of information about the car itself, where it was built, what model it is and what engine originally came in the car (generally or specifically after 1972). 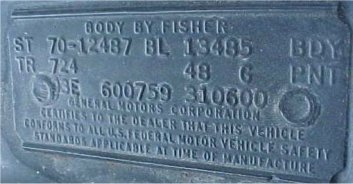 A trim tag or body number tag is FISHER BODYS representation of the car. It is used to identify when the car was built and how the car (body) was originally fitted out, what type of seats, colors, etc... finally, the engine, transmission and rear axle markings tell where the unit was made or assembled, when it was made, what the specific characteristics it is and usually what it was originally installed in. By decoding these items, you can gather a lot of information about your car as well as check the originality of a car. This is especially helpful if you are checking out a "numbers matching" car where the asking price is usually higher. If any item appears to be amiss, you should be VERY skeptical of the originality of the car. However, in some cases, legitimate changes could have been made (warranty work, production assembly line substitution, etc...) Most of this information pertains to the Chevrolet Camaro. Please note - this site is heavily slanted towards Chevrolet decoding with an emphasis on Camaros. 1970 to 1981 specifically. Decoding other cars is similar but don't be surprised if you find an omission here or there. The VIN is the Vehicle Identification number. It is the legal definition of the car - regardless of everything else you're looking at. When you buy ANY car, the VIN on the piece of paper in your hand MUST MATCH the VIN affixed to the car. Otherwise you're dealing with 2 different vehicles. And while it should be obvious - if you decode a Trans Am vin and you're buying a Camaro.... or you have what looks like a Nova sitting in the driveway, but the VIN decodes as a Monza... remember - the VIN is the car. And if the VIN says the thing is a Monza and you're trying to buy a Nova - nevermind the paperwork. Walk away. The VIN is 13 digits long, until 1981 when it goes to 17 digits. "Carfax" needs 17 digits - therefore it can't do anything with a pre-81 vehicle. The VIN is affixed to the car with specific rivits called rosette rivits. It is not affixed with hardware store pop-rivits. If at all possible, never touch or remove the VIN from the vehicle for ANY reason. In extreme cases where you have doubts about the validity of the VIN affixed to the vehicle (i.e. it's been tampered with or affixed with pop-rivits), you would double check it against the hidden (or confidential) vin. This number will be stamped on the last substantial thing that'll get destroyed during the cars life. In the case of the Camaro - this is the firewall, BEHIND the heater box. The theory is - if the firewall is destroyed, the whole car is gone. You won't accidentally fix and alter or obliterate the confidential vin during the repair process - so these numbers will always match up. Here's the hidden vin on a Camaro. The format is not the complete VIN, but enough to conclude the original VIN's number. The VIN will contain MODEL information. The "SS", and "Z28" are NOT MODELS. They are options. Options aren't coded in the VIN. However, beginning in 1972 when the specific engine is coded into the VIN, the ENGINE will give away or hint at the option. These 2 option packages required specific engines and the VIN engine code will nail down a Z28 or an SS. This becomes somewhat useless after 1974, but helpful again in 1981. The Type LT and Berlinetta are Models and the VIN will reveal this. The sequential number for the vehicle doesn't start at 000001. The Camaro generally starts at either 100001 or 500001, depending on year and assembly plant. This way if the plant is building 3 different vehicles, each vehicle line will be in a unique sequential range - Camaros at 100001, Novas at 300001, Impalas at 700001, etc... The first 10 or 20 cars are usually pilot cars and go to places other than dealers. 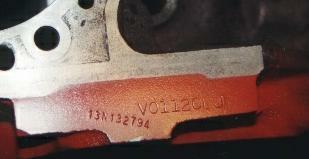 The VIN Number breakdown for specific year Camaros is located under each year Camaro information as the information contained in the VIN changes from year to year. 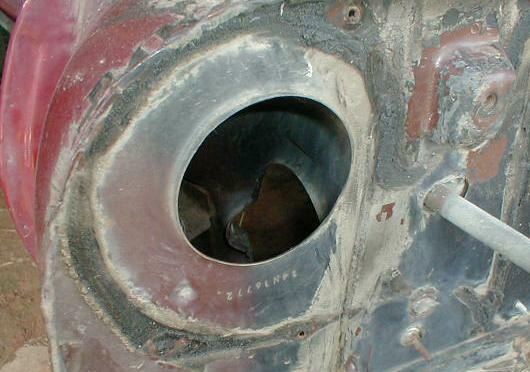 The VIN on the 1967 Camaro is on a stainless steel plate rivited inside the drivers door jamb. All other models have the VIN located on a plate visible through the windshield on the drivers side dash panel. 1st digit: GM Line number: Chevrolet = 1. 8th through 12th digits: Sequential production number starting with 100001. 1st digit: GM line number, Chevrolet = 1. 3rd and 4th digits: Body type: 87 = Sport Coupe. 5th digit: Engine Code: See specific year (camaro info) for breakdown. 8th through 13th digits: Sequential production number starting with 100001. The VIN format in 1981 - 1984 changed. 1st digit: Country of origin: 1 = USA, 2 = Canada. 3rd digit: Division, 1 = Chevrolet. 8th digit: Engine : See specific year (camaro info) for breakdown. 9th digit: Check digit - used to verify that the VIN was recorded correctly. 12th through 17th digits: Sequential production number starting with 100001. The following contains information which gives an example of what the various positions in a 1979 VIN stand for. In 1972, plant codes changed to reflect the VIN code. For example, "NOR" = Norwood before 1972. In 1972 and on, it was simply "N". The Cowl or Trim tag is FISHER BODYS representation of the BODY. Not a vehicle, but a shell. In Summary, Fisher body doesn't care if this is a Camaro or a Firebird. They need to know what color to paint the thing and what style & color interior to put into it. Anything related to their assembly of the thing and what they need to know is represented on it. After they're done with it, it gets the Division specific goodies. The trim tag is not a legal piece of information. It's informative, but not definitive. In otherwords, a trim tag hinting at a SS 396 Camaro with a 6 cylinder VIN number is not an SS. It's a 6 cylinder Camaro - regardless of what the tag says. The VIN trumps the tag. What you see is what you get and that trumps the tag too. But it's nice to know what the tag is saying. Hopefully what you see is agreeing with the tag itself. You won't get arrested for removing or switching tags but you may wonder WHY the tag was switched, if it was. I have no idea why people would do that... it could be innocent or it could be for nefarious purposes. The Tag is generally rivited onto the body, except in some years (1973 & 1974) where they simply screw it onto the car with sheet metal screws. A note about paint. As we know, Fisher Body paints the car. Generally, the regularly available color code will be indicated, but occasionally, you'll see "--" where a number should be. This means the car had SPECIAL PAINT. It doesn't say WHAT paint was used - simply that the car isn't getting a stock offered color. It could represent anything. Sometimes (generally not on camaros) - a WA code will be stamped, and you can translate that WA code to a color. Or it might have the color code from some other car line on it. Generally on the Camaro, special paint is represented as "--", and it's generally indicating "black".... but not always. You'll need to check the Build sheet (if available) or check for trace evidence on the car as to the original color. Otherwise, your guess is as good as mine. The Corvette is totally built by Chevrolet. It has a tag, but it's not a Fisher Body tag. This also explains why you will find complete assembly instructions in the Assembly Manual and Shop manual. All aspects of the Corvette are Chevrolets responsibility. Location on 1967 - 1969 Camaros is on firewall next to brake booster. From 1970 - 1981 it's facing up on the cowl panel as you open the hood, right near the windshield on the drivers side. 1982 - 1985 model location is under the hood on the radiator cross support. Mid 1984 models contain the body tag and a Service Parts Identification Label located in the center of the console cover). In 1986 the body tag is no longer used, replaced with just the Service Parts Identification Label (which is useless if you replace the console lid). The Service Parts ID Label contains VIN, option codes, paint type, paint code, convertible top code and interior trim code. Norwood built cowl tag decoding. Read the tags from left to right, top to bottom. Additional detail may be hyperlinked and spans years. My individual yearly Camaro information also has a tag specific to the year contained in there, as well as a wide amount of color/trim information specific to that year. Where OPTIONAL is mentioned, this data may or may not be present. ** For example, if the car doesn't say Z27, it's 99.9% sure it's NOT a SS car. 03D = Build date (month/week). 03C = Build month & week. 74A = stripe code (Carmine) Optional? Assembly plant code designation changed in 1973 from 3 characters to 1. See above for additonal examples of assembly plants for other car lines. Body Sequence Number - production serial number of the body, won't match the VIN sequence. Trim Code - Indicates (interior) trim color and material. Due to the wide variety of trim colors available, and especially after 1973 in which various dashboard, rug & fabric combinations were offered.... it's best to select the year you wish to decode from the drop box below. Seat Type Code - Beginning in 1972, this code identifies the type of seat installed in the vehicle. Code A51 (front bucket seats) was the standard seat, unless equipped with AN6 adjustable seatback. Paint Code - indicates the exterior paint color and vinyl top color if so equipped. A two part code indicates bottom and top colors respectively on a 2 tone paint option, or what color an optional stripe, convertible top or vinyl top was ordered. When a car has the same upper & lower code, it can be assumed the car was a solid color. Due to the wide variety of colors available, and especially in later years in which color keyed wheels, dual or triple tone color schemes or stripes were used, it's best to select the model year car you want to decode from the drop box. In addition to the codes, I've added color chips where available. Note: Starting in 1979, the trim tag could also contain the PAINT TYPE Code. Build Date - digit 1 & 2 identify month, 3rd digit identifies week. On Norwood cars, Z28 and SS (Z27) will be indicated here. In addition to the "FS" on Type LT's, a "S" may be in this area to signify Type LT's. In 1975 with the reintroduction of the Rally Sport, a Z85 will be in this position. In 1979 that designation was shortened to "Z". If the car was a standard sport coupe, this area would be blank. If the car was a Z28 the number next to the code is the stripe code. The stripe code corresponds with the year paint code. Blank = no stripes. 19 = black, 10 or 11 = white. One word of caution.... the "reproduction" (or counterfeiting) market is now making these tags for sale - stamped as the buyer desires. As such, extra scrutiny should be used in comparing the body tag, VIN, any other documentation, and the actual car, to look for oddities. The other "demand" for these tags is not just to fake Z28's or Super Sports, but to restore a car, then get a trim tag to match the restored car and try and call it "100% original". Not many people want to meticulously restore a lime green car with tan interior. Batch codes - Very few people know how to decode these. I'll put more in here later. With the counterfeiting of trim tags, this is the last code which could be used to scrutinize the trim tag as being straight up, or faked. This file has gotten so large that I've split this file up and moved the engine identification information here. This file has gotten so large that I've split this file up and moved the chevy transmission identification information to here. This file has gotten so large that I've split this file up and moved the chevy rear axle identification information to here.